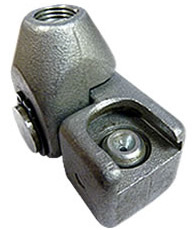 90 Degree Swivel Button Head Coupler. (Push-On). Made of Zinc Plated Corrosion Resistant Steel. Swivels 90 Degrees in Both Directions. For Use With 5/8" Headed Fittings. Thread: 1/8" NPTF(f) / Working Pressure: 3,000 PSI.